OpenOffice.org–an application suite, not just a Web site—has tricks even Office can't manage. Here are a few that may not be obvious, plus a few ways to make it less annoying out of the box. We are starting to see more movement in adoption of OpenOffice. There are many reasons, but a recent article in PC Magazine, http://www.pcmag.com/article2/0,2817,2341228,00.asp, lists some really killer features. Pay special attention to legacy formats. 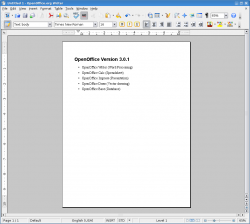 Using OpenOffice one can open just about any file, DOC, XLS, PPT, old or new. Altamente was consulted on an article that came out today in Caribbean Business, a local business journal in Puerto Rico. I think they got the article right. It came across as balanced and productive. At Altamente, we have never been proprietary software bashers, but we do know that Open Source/Software Libre represents a considerable business advantage in many areas. Read the article and give us a call. We would be happy to save you 20% on your I.T. budget while giving you a leg up on your competition. The secret to a more secure and cost effective government is through open source technologies and products. Open Source or Software Libre deserves a prominent place in the proper functioning of Government. From transparency in accounting to public policy, software applications and open data formats allow equal access to information that rightly belongs in the public domain. President Barrack Obama has begun his term with a request to Scott McNealy, co-founder of Sun Microsystems, to explore in what manner Open Source can serve the public good. The claim comes from one of Silicon Valley's most respected business leaders Scott McNealy, a co-founder of Sun Microsystems. He revealed he has been asked to prepare a paper on the subject for the new administration. "It's intuitively obvious open source is more cost effective and productive than proprietary software," he said. Mr McNealy told the BBC he wants to ensure the government does not get "locked in" to one specific vendor or company. It is obvious to us as well. The real benefit is, however, not that you do not have to pay anyone for software and services, but that you are not required to pay a particular vendor. Open Source software distributed under the GPL license allows you, the company or organization, to choose your partner. Since you have a choice, vendors compete for your business, and as a result may provide a more competitive solution. Read "Top 10 Ways to Save Money on IT in 2009" for a better idea of Altamente's ideas on IT costs. Do not pay for software. Pay for services, and make sure that there are companies competing for your service contracts. Keep your data in containers that you control. Make sure you can plug them into products you own. Save money – get better results. Find out how Altamente can help you save 20% on your total IT expenditures in 2009. Call us at 314-787-8443 or 787-638-5380 or contact us here using this form. Here we present ten ways to downsize your IT costs in 2009. A lot of these tips end with the punchline: do not pay for software. That is a common theme here at Altamente. It saves us a ton of time and hassle, but let me illustrate it thusly by the following familiar scenario. Executive to IT department: “Hey, we need to be able to do X. Think you can get that for us.” IT guy investigates and purchases a “solution,” implements it, and the boss is happy. Typically, by the time the features you crave become available, you have to pay for an upgrade, migrate your existing data, upgrade your hardware because it will not run on your system and on and on and on. To top it off, your IT department is a glorified middleman between the software seller and your company. Stop all of that nonsense, and choose an Open Source solution immediately. You will have the capacity now to 1). Make your own changes, 2). Avoid improper relationships between your IT department and software provider, 3). Make your IT department the owner, developer, and parent of the solution. Make sure your company's assets are not locked up in your software provider's locked box. People who sell software love to “hold” your data for you in formats they control. It may seem innocent enough, but when it comes time to upgrade, because of obsolete hardware or software, you wind up at their mercy and the backwards compatibility of their data formats. Try to take your business to a competitor's software, and you will find that your dataset cannot be exported, massaged, or extracted to the new product. It is your data. You developed it. Why would you choose to warehouse it at someone else's facility where they control the key? The solution: Open Source software, and open data formats based on an open/free XML schema, an open source SQL database, or any other sensible data format that does not attempt to hi-jack your data. Try Open Office for your DOCs, PDFs, spreadsheets, and presentations. Just like a proprietary database controlling your data, proprietary software many times dictates the service relationship as well. If you have X software, you must use company Y's service team. Company Y is probably a Value Added Reseller(VAR) for software X, and has a vested interest in making sure you keep using software X and by default company Y. By the way, company Y holds an exclusive arrangement with software company X for your entire region. Good luck finding someone else. Open Source changes this restrictive supplier/customer dynamic. Because companies like Altamente are not exclusive agents of Open Source software, anyone is free to provide support. If a supplier is not a good match for your organization, you can may someone else who has the exact same rights to see the software, own it, and make changes to the underlying source code. If you do not like or trust outsourcing, you can hire someone to provide the service and maintenance that you need. You are not locked into exclusive or predatory arrangements with your software provider. You control the relationship, and a convenient by-product is that your software is more cost effective. Do you need to set up a workstation for someone who will be accessing a web-based knowledge application, email, customer relationship management (CRM) software, and groupware? Why would you need a dedicated PC to accomplish this? Use a Linux-based thin client solution to provide an instant-on environment which is available to your employees from any free workstation. All the software is free, open, and easy to use and better yet, and has a lower total cost of ownership. How much downtime and IT overhead go toward the battle with malware on your network? How much money would you save if I told you that you could reduce your malware attacks and IT overhead associated costs. Put your IT guys back to work creating innovative solutions for your business instead of triaging rogue PCs on your network. The rise of CPU-based virtualization technology means that it is easier and cheaper to run multiple machines and services on a single hardware box. This has always been possible, ever since the first multi-user computers of the 60s, but it has never been cheaper or easier. Do you need a new Windows Server instance to provide a single application for a specific production problem? Fire up a virtual image inside of your robust redundant 64 bit Linux-based virtual host, configure Windows Server, test your app, and deploy it. You do not need new hardware. You do not need to take a trip to the server room. Win and win. On the Server: Do you need a heavy duty mid-range server for your data center? Do you need more than 4 gigabytes of RAM? If you are running Windows Server, then that is going to cost you a bundle for upgrades and licenses for the 64 bit version. How many people will access it? That is going to cost you seat licenses. Ouch. Stay away from all the licenses, costs and restrictions and choose Linux and Open Source. With Linux you can have that same server running a 64bit operating system and software stack, accessing more than 4 gigabytes of RAM (32 gigabytes makes for a very nice machine) for much less money. Did I mention there are no seat licenses? On the Desktop: Are you buying new PCs only to find that they barely run Vista, or are you forced to buy new machines to keep up with the requirements of the newest software suite? Forget all that, and put Linux and Open Source Software and open data formats on your existing hardware. You have access to a modern multi-user, latest technology software, running faster on your older hardware. You can squeeze three or more additional years out of your hardware before you will need to repurchase. When that time comes, maybe you will select more economical and less exotic equipment to save money. You already know it will work just fine. You do not have the time or the money for this unless you are a software company. You should put most of your effort into producing your widget or providing your service. But you still need software, right? Get your IT guys to investigate a high quality Open Source/Open Data solution, and adapt it to your business. You will own it just the same, but isn't it nice that you did not have pay for those thousands of man hours it took to write it? You will save money, keep from being locked in with a vendor, and have the exact features you require. Use ClamAV at the server level to filter emails and webpages. Use Linux on the desktop and you will most likely never ever have to deal with data breaches, password theft, or lost data and downtime due to malicious viruses on your network. Not only is it easier to secure Linux, but its transparent development process makes for a quick turn around when problems are found. Here at Altamente, we happily go about our business without the distractions that plague other companies. It saves us time and money that we put toward development and other projects. In these tight economic times, is it not about time you to switched to Open Source/Open Data? I am sure it was going to be obvious what my solution for the economic downturn might be. Use Open Source/Open Data. Do not pay for software. Pay for services, and make sure that there are companies competing for your service contracts. Keep your data in containers that you control. Make sure you can plug them into products you own (Open Source software). Save money on your hardware purchases. Keep your hardware for longer at the same performance level. Avoid wasted CPU cycles running anti-virus and anti-malware applications. Take full advantage of hardware virtualization technology. Take full advantage of today's 64bit multi-core processors. Use more memory more efficiently. Run your SQL database server on 64bit software with access to gobs of memory for less cost. Trend Micro recently bought MAPS, an email black hole service. Their DUL list is wrong, out of date, and poorly maintained. DO NOT USE THIRD PARTY DUL LISTS! Am I yelling? Sorry about that. I just want to make it clear. There is NO good reason to use a third party Dial-up User List. You can still block dynamic dial-up users from sending mail, but you should do it through reverse DNS, the common mechanism that every sane ISP and mail administrator uses. What am I talking about? Okay, first, here's a little primer on how a modern email handoff works. A mail server receives a request to deliver mail to port 25 SMTP (actually it is a little more complicated than that, but let us just say for now that's how it works). The mail server then checks the IP of the sender. As a first step, my server might reject the email solely on a hard-coded rule at the IP level. Oops, I do not accept email from your server. Perhaps I have had problems with abuse from that particular IP before, so I might choose to reject it before even looking at it. "Go away," and I slam the door. If the IP passes that first check, I might process others. Perhaps we might run a reverse DNS request on that IP. The response might come back as ppp-user1-1.0.0.10-dynamic.com or something similar. I can at this point choose to reject the email based on the keyword PPP (dial-up user) or USER. I can be reasonably certain that no corporate or professional mail administrator would allow his important email server to have such a reverse DNS name. But we are not done wringing all the secrets from the IP address. Next I will check the reverse IP, get the host name, and then check the forward IP. ppp-user1-0.0.0.10-dynamic.com might not exist as a forward record and again, I might reject the email based on the fact that the network of origination is completely messed up. Messed up DNS is a good indication this might not be a network from whom I wish to accept mail. Now that I have established that your email server has a correct reverse/forward IP and you are who you say you are, I might also check to make sure that your server is the correct MX (Mail exchanger) for the domain in question. So far so good. We are almost there, but now we must pass the content filters, a gauntlet of truth so to speak. My server will now tell you to proceed with your SMTP stream. We will carefully parse it for bad info, viruses, obvious references to scams, Viagra, and general spamminess (all SMTP is text, by the way). At the end of the SMTP stream, I will announce I have accepted the email for delivery and issue a code 250 (it's an older code, but it checks out. I was about to clear them). If, on the other hand, I choose to reject, my server will issue a code 553, a catch all for general errors, and I bounce your mail or drop it. The reason you should never use a third party DUL list is quite simply this: reverse DNS already neatly identifies the type of host from which a mail connection originates. It (reverse DNS) is maintained by the ISP and is distributed throughout the world via the wonderful system called DNS. At no point do you need to set up a separate private company to maintain this list (and introduce one more layer of record keeping and error).